Maple Farm Sanctuary is pleased to welcome four new members to our Board of Directors in 2019! MFS Co-founders Jim and Cheri Vandersluis, the latter who serves as the sanctuary’s Executive Director, look forward to working with these dedicated individuals to help MFS grow and make a difference for even more animals in 2019 and beyond. Read on to find out more about our new board members and their hopes for MFS, special animal bonds, and thoughts on the farm animal protection movement. Marlene has a professional background in business management and has worked for the Massachusetts Department of Fire Services, a wide range of school systems, and the biotechnology sector. She has taken on just about every volunteer role at MFS, including serving as the sanctuary’s Tour Director for the past three years and networking on behalf of MFS with other sanctuaries and corporations. Why did you join the MFS Board and what are your biggest hopes for the year ahead? Is there a particular animal, at MFS or otherwise, who has touched your heart in a significant way? What do you think is the most critical issue for farm animal protection right now, and how can farm animal sanctuaries play a role in solving it? Karen is an attorney by training and currently works for Commonwealth Medicine. She has always had a strong interest in animal rights, including completing an internship with Gary Francione and the Animal Rights Law Center at Rutgers College of Law. Karen also runs Positive Change for Animals, a volunteer group that encourages people to join together to change the social context of the animal rights movement. “I joined the board at the request of other members, and out of a desire to help both the animals of the farm and the very dedicated people I met. The farm is a living model for animal rights, providing the direct opportunity for people to interact with farm animals and see how similar they are to the pets whom they adore. “Gail, a former dairy cow, is an example of the miraculous and generous attitude of many rescued farm animals. Although she had been a dairy cow for almost a decade and had countless babies taken away as well as deprived of their mother’s milk, she is accepting and loving towards people who visit her. Diane worked as a CPA at World Education, a non-profit dedicated to education, for nearly 25 years before retiring in 2015. In 1994, she began volunteering at a Greyhound adoption center and realized there was a significant need to help retired racing Greyhounds. In 1999, she founded and became Executive Director of Greyhound Rescue of New England Inc., a small non-profit dedicated to saving retired greyhounds that has placed close to 1,000 dogs in loving homes. “Living in Mendon, I have known Cheri and Jim for many years. 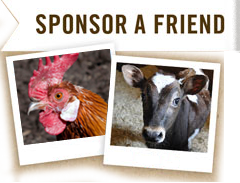 Their dedication to saving and loving farm animals as well as living a compassionate lifestyle is so very evident. Being a vegan myself for almost 20 years, I strongly agree with their vegan lifestyle and also have a fondness for needy farm animals. Chrissy has been a Private Investigator for the last 20 years. Her job not only enables her to be out in the field but also gives her the flexibility to volunteer regularly at MFS. Since September 2016, Chrissy has taken on various volunteer roles, including doing hands-on barn cleaning, supervising other barn volunteers, and helping with animal care and events. She is also very active in the local vegan community and founded the Rhode Island Vegan Lady Gang.